As part of the centenary commemorations of the voyage of Titanic, the Irish national broadcaster RTE produced a special History Show programme on the luxury liner. Broadcast on RTE Radio One on Sunday, presenter Myles Dungan spoke to a panel of guests which included Know Thy Place Director Damian Shiels. We carried out a lot of unique research into the Irish links to Titanic for our Know Thy Place Titanic Chart and Damian discussed some of these stories with Myles. The programme was recorded in the atmospheric surroundings of the Titanic Experience in Cobh, which occupies the building where Titanic’s last passengers embarked for the doomed vessel. The show is now available as a podcast, which you can listen to by visiting the History Show site here or by going direct to the podcast at the following link: RTE History Show Titanic Special. 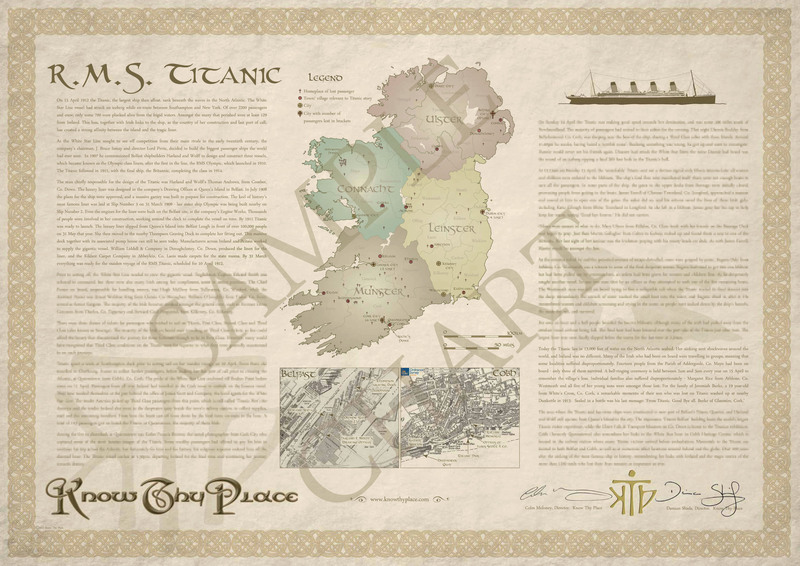 The Titanic Chart is a unique record of the White Star liner’s links to Ireland, and is available for only €39.99 or $56.00. If you are interested in ordering a copy you can do so from our website here.